Bengaluru, Feb 10: Hours before Prime Minister Narendra Modi launches BJP's campaign in Karnataka for the Lok Sabha polls, the Congress Sunday questioned the saffron party over its alleged bid to topple the coalition government is the state. The Prime Minister is scheduled to address a rally at Hubballi in northern part of the state later this evening. 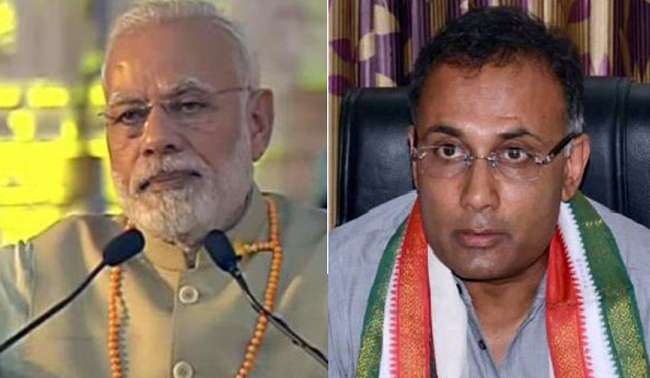 Speaking to reporters here, Pradesh Congress President Dinesh Gundu Rao posed a few questions to Modi and demanded answers from him. "Your (PM's) popular slogan has been, 'Na khaoonaga, na khaane doonga' (I will neither indulge in corruption, nor let others indulge in it). Then how did you let horse-trading and bribing of MLAs by your party leaders take place in Karnataka? Are you willing to take any unethical action in order to attain power?" he questioned. "How do you justify statements of your party leader (B S) Yeddyurappa in an audio clip that surfaced, where Yeddyurappa offered money to MLAs to switch sides and spoke about your illegitimate control over the judicial system," he asked. "Please make it a point to answer these very legitimate questions during your visit to Hubballi. These questions aren't political in nature. These are quintessential questions of public importance, especially to the people of Karnataka," he said. Amid the turmoil in the ruling coalition that has cast a shadow over the stability of his government, Chief Minister H D Kumaraswamy had Friday released the audio clip in which Yeddyurappa was purportedly trying to lure JD(S) MLA Naganagouda through his son. The state BJP strongman had, however, said the audio clip was 'fake' and a "concocted story". The KPCC chief also alleged discrimination by the Centre against the state, saying Karnataka was reeling under drought and had requested Rs 2,400 crore to deal with it, but the Centre has released only Rs 900 crore. On the other hand the central government's assistance to NDA-ruled Maharashtra stood at Rs 4,714.28 crore, he claimed. He said mandatory payments of MGNREGA (Mahatma Gandhi National Rural Employment Guarantee Act) workers to the tune of Rs 2,000 crore is still pending, and hit out at the Modi government for claiming credit for establishing an IIT in Dharwad, without acknowledging the state government's contribution for allotting a 500-acre prime land. Ahead of the BJP rally, the PM is scheduled to lay the foundation stone of the Indian Institute of Technology (IIT-Dharwad) on Sunday. Alleging that the Karnataka Chief Minister was not officially invited to the event, Rao termed it an 'insult' to the state. He also targeted the PM on Rafale deal and alleged "sidelining" of Bengaluru-headquartered HAL.